We were three college students on a budget that just rented an old, unique, little house for the school year. It was drab and boring, and the carpet was a shaggy tan color. We all agreed something had to be changed for a more cheerful living arrangement. 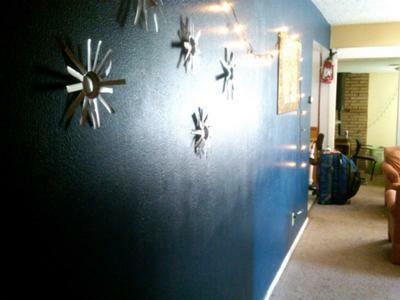 We decided we would paint the living room walls a creamy color to keep things semi neutral (and the landlord happy), but we choose a deep blue for the hallway wall that would add a burst of color to the wall leading into the living room. The brand of this blue was by Color Place and the name was Stargaze. 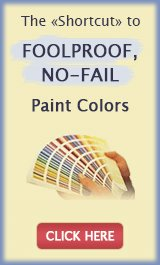 We choose this paint color because it seemed to work in all different types of light and it would add character to our boring house. It was also cheap! It turned out beautifully. We have a painting and lights hung on the wall which only compliment the paint color. The lights also make the wall look as if you're walking through the night sky at night which is very romantic. It's my favorite hallway in the house! 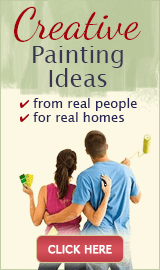 This painting idea is so "college students"! Very lively and full of energy. You guys did a great job with it!